What Shape Diamond Engagement Ring Do You Want? 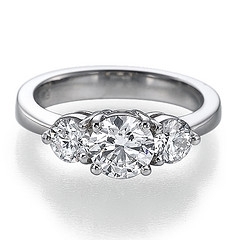 In your opinion, when you see a woman with a heart-shaped diamond engagement ring do you think it’s cheesy? I know some people are into more classic rings. Personally I love them. What shape diamond ring do you prefer? Princess Cut has always been my favorite. Heart shaped is nice and original as long as it’s not too big. it would be hard to find a wedding band to match the shape though. Red♥, that ring is gorgeous! This entry was posted in Glittering Diamonds and tagged diamond, engagement, jewelry, ring,, rings on November 1, 2009 by admin.